More than anything Iris wants to ride Rain, the wild horse. 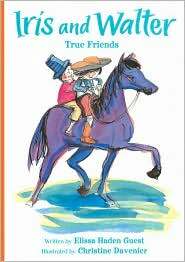 Her friend Walter tells her that she can't ride Rain because the horse will not allow it. Still, when Iris tries to make friends with Rain he does his best to help her. He explains that horses like "clucking and carrots and gentle hands." Rain will not respond well to Iris' loud noises and Grandpa's special cookies. So Iris clucks, and speaks softly, and brings Rain carrots, but the horse does not respond. Iris wonders what she is doing wrong. Perhaps the horse doesn't like her. Walter suggests that Rain might be afraid of Iris. So the children keep on trying. Day after day they visit Rain and talk to her, offering her carrots. In this winning chapter book two friends help each other solve some worrying problems. With each other's support, the problems end up being a lot less difficult to deal with, and a solution is found . The two stories in this book were carefully written to suit beginner readers. The stories are warm and perfectly capture the special closeness that good friends share.